In this day and age, when stress is taking its toll on the best of us, it’s time we took relaxation seriously. Not only does it put health at stake but also the quality of life and the productiveness at work, so no, relaxation isn’t luxury, it’s necessity. Instead of spending money on visiting local spas, getting massages and treatments, why not turn your own home into a relaxing oasis? This way every day would be your pampering day. 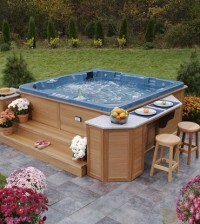 When it comes to a spa, you don’t require much space to be able to reap the benefits of hydrotherapy, just get a square hot tub and you have enough room for five people; in case it’s more space you have available, you could go for a round one. Since they are equipped with hydrotherapy massage jets, recliner lounges, as well as underwater multi-coloured LED lighting, it’s safe to say they were created for relaxation. Reducing the effects of daily stress isn’t the only advantage you can expect to have when using the square hot tub, as hydrotherapy is known to improve the immune system, lower blood pressure, and relieve aches and pains. And the best of all is you can set your own mood with the help of lighting effects. You can make it more enjoyable by adding a candle or two just to promote a more serene and calming ambiance, so you’d have your own rejuvenating area in your home that makes you feel great just by looking at it. Don’t forget to count on some music either; music is therapy itself! Additionally, you should consider the help of aromatherapy. Even if you’re not a fan, simply try adding a drop or two in the tub of a certain essential oil known for the soothing properties, such as lavender, and see how you come to enjoy it. Moreover, you’d be glad you did so since it promotes good sleep! Of course, pampering doesn’t only have to mean things body-related but mind-related too, so while you’re having a fun time in the tub try staying mindful, breathing deeply, thinking of the things that make you happy, the things you’re grateful for; you’d immediately zone out, and uplift your mood. Now, where there’s relaxation, there can’t be clutter, that’s for sure. What this means is unless you’ve taken time to get rid of the clutter by now, you better do so as soon as possible. You’d be surprised at how much seeing your home clutter-free would affect you positively. A clean home is a comforting home!